Whether you are celebrating Thanksgiving with family and friends or having some relaxing time for yourself, know that we appreciate your ongoing support. 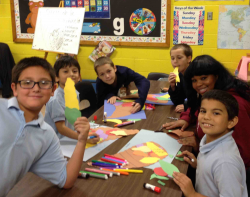 Because of your efforts, Art Sphere is able to share art with Philadelphia kids and their communities! Art Sphere Inc. has been quietly helping to build the communities for the past fifteen years by using art as a central theme. With events such as the Park Cleanup Days, we bring our community together by using hundreds of volunteers to revitalize neighborhoods and help teach art programs. Thank you for choosing to give back through Art Sphere, Inc. You have helped make a significant difference by maintaining vital neighborhood resources for recreation centers and playgrounds serving Philadelphia youth. It’s not just beautifying public spaces, but transforming places and people through art. Paint and Park Clean up with us! Visit us! 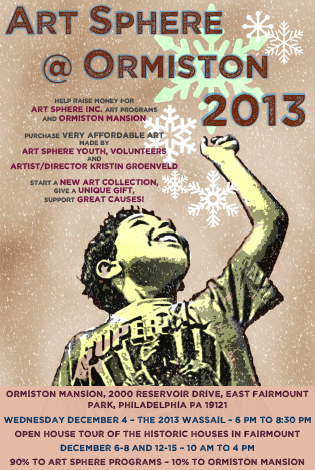 our Studios and other Artist studios to learn more about our programs, celebrate with other volunteers and purchase very affordable art December 7 and 8 , 12-6 email kristin@artsphere.org for more information. children in 2014. Thank you for contributing to art and culture close to your home and your heart this holiday season. It’s never been easier to share a smile with someone and share a love of the arts to continue a legacy of creativity. Whether you’re doing holiday decorating or grabbing some goodies for your loved ones, Amazon.com has found a way to merge shopping and giving in the best way. Go towww.smile.amazon.com. Art Sphere Inc. utilizes art and the imagination to motivate others, solve problems, and inspire innovation and initiative along the way. Thank you for helping us connect the dots between individuals, communities and neighborhood resources with art education! You are invited to volunteer at our office or participate making art at our many sites . See ASI postings for specific volunteer needs at http://www.volunteermatch.org/ orhttp://volunteer.phila.gov/#s including a call for volunteer groups to participate in January 2014 MLK Day Events! Art Sphere Incorporated (ASI),brings the joy and power of artistic expression to under-served youth and communities throughout the Delaware Valley.A 501(c)(3) charitable non-profit founded by painter, print-maker and Philadelphia-area native Kristin Groenveld in 1998, Art Sphere works with communities to promote individual and civic empowerment through art education.Led by a core staff and sustained by a dedicated volunteer base ASI offers comprehensive educational and community building experiences, providing teachers, curricula and materials where they’re needed most.